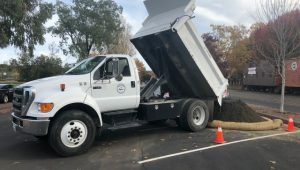 The City of Sonoma responds to natural and man-made emergencies that occur within City limits, and works cooperatively with neighboring agencies to address emergency issues throughout Sonoma Valley. The City's Emergency Operations Plan (EOP) sets a framework that guides the actions that City officials and employees will take in emergency situations associated with large-scale disasters affecting the City of Sonoma. A key component of preparedness in any community is the extent to which its residents and businesses have themselves planned for what to do in the case of an emergency. The S.C.O.P.E (Sonoma Citizens Organized to Prepare for Emergencies) program provides guidelines and training for neighbors to work together to prepare for disasters, visit SVFRA's website for upcoming S.C.O.P.E training dates. Sign up to receive alerts to your phone and/or email. For SoCo Alert, use the link or call (707)565-1369 for more information. For Nixle, use the link or TEXT YOUR ZIP CODE TO 888777 to opt in for mobile alerts. Make sure your family, friends, and neighbors also sign up! SoCo Emergency: If there is an active emergency in Sonoma County, detailed information will be posted to the Sonoma County Emergency and Preparedness Information website by the County of Sonoma. 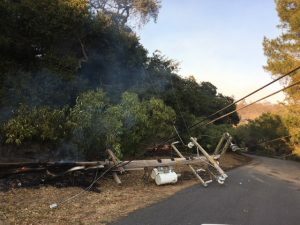 City of Sonoma Emergency Updates: The City of Sonoma will post information regarding warnings and emergency updates to the Emergency Updates page. Social media can play an important role in sharing information before, during, and after emergencies, and if you are active on social media it's a good idea to follow facebook pages for the City of Sonoma, Sonoma Police Department, Sonoma Valley Fire & Rescue, County of Sonoma, and Sonoma Sheriff. The City of Sonoma may also share information through Nextdoor. Due to potential delays in posting information, please do not rely on social media as your primary notification of a local emergency. Are sandbags available during floods? number of sandbags available free of charge during normal business hours. Visit our sandbag instructions page for details. How can I prepare for local emergencies or disasters? Visit our Emergency Preparedness page to sign up for alerts through Nixle and SoCo Alerts, learn how you can participate in training with S.C.O.P.E. (Sonoma Citizens Organized to Prepare for Emergencies), and review a variety of resources on steps you can take now to get your family, home, and pets prepared for emergencies. You can also register as an emergency volunteer. 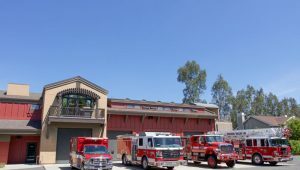 The Sonoma Community Center serves as our community’s Emergency Volunteer Center (EVC). The EVC registers volunteers and, in the event of a disaster, takes requests for volunteers and matches them to where they are needed. How do I report flooding? To report localized flooding in Sonoma city limits during regular business hours Monday – Friday, 8:00 a.m. – 5:00 p.m, call the City of Sonoma Public Works Department 707-938-3332. To report flooding after regular business hours, call the Sonoma Police Department Non-Emergency Dispatch at 707-996-3601. IN AN EMERGENCY CALL 9-1-1. 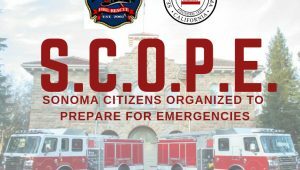 Sonoma Citizens Organized to Prepare for Emergencies, or S.C.O.P.E., is a program of the Sonoma Valley Fire and Rescue Authority that includes emergency response, community preparedness, utility safety, and fire prevention. Visit SVFRA’s website to learn how you can participate in upcoming community training sessions. What steps can I take to prepare for wildfires in the future? Learn more at CAL FIRE’s Ready For Wildfire website, and be sure to sign up for Nixle alerts from the Sonoma County Sheriff’s Office.